This week, DMI Studios has been knee deep in all things Search Engine Marketing while attending the SES Conference & Expo in Chicago #SESCHI. SES provides marketing professionals, brand advertisers, agencies, and business leaders with the knowledge and tools needed to traverse the dynamic digital landscape. Translation- the best and the brightest gather together to share ideas and talk about what's new and trending. While our brains are still brimming with everything we've learned, we thought we give a few quick highlights and interesting facts. Over 200 data points are used by Google to determine organic positioning. The top 3 are Site Structure, Frequency of Updates and Linking- Content really is king! 100 billion queries per month come into Google. 16% of Google inquiries have never been seen by Google before. 80% of queries have no exact match. 40% searches are over 3 words long. 5.6 billion queries per month come into Bing. Bing controls 30% of the US Market. Bing has 151 million unique users. Bing claims to have 46 million users that don't also use Google. Bing users spend on average 5.4% more per transaction than Googlers. There's 1 billion products in Google Shopping. Google Shopping boasts over 100,000 retailers. By submitting themselves for review by Google, a retailer can become "Trusted" by Google. Google reports a 5-10% gain in orders for stores that have become trusted. Social campaigns on Facebook or Twitter can also help with other campaigns like content marketing, link building, brand awareness, lead generation and SEO. Social Media can be used as a way to get others to do your work for you- spreading the word about your brand. Twitter processes about 1 million tweets per week. 20% of all tweets are invitations for product info and 48% are to introduce a brand. 25% of internet users go to a website after learning about it on some form of social media. 500 billion minutes a month are spent on Facebook. Wal-mart.com does 1/20 the sales of Amazon.com. Google is offering up to $10,000 a month in free Pay Per Click ads to Non-profit organizations. Mobile marketing accounts for only 1% of ad spend but 23% of web use. Local Search comprises 40% of all mobile traffic. Whew! That was quite a brain dump! We'd be more than happy to talk with you about more ideas and options that could impact your business- just give us a day or two for the swelling in our heads to go down! DMI Studios is well-known around Green Bay as being an industry expert for all things related to the web. Owner, David Troup, can periodically be heard on talk radio informing people about the story of DMI Studios, their creativity and cutting-edge technology as well as giving helpful marketing tips to area listeners. 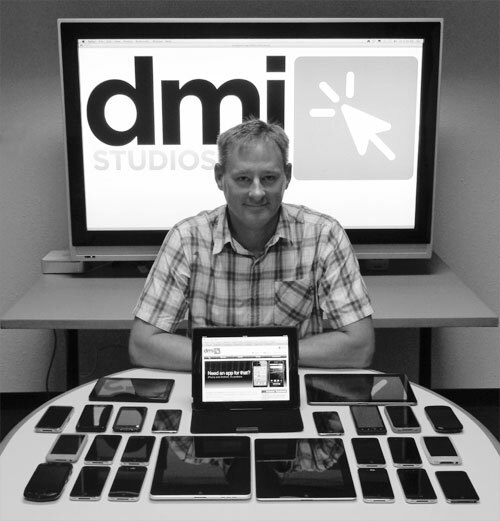 DMI Studios "...is taking its own advice these days and giving itself a new look to better tell its story as a major player in web design, web solutions and online marketing in Green Bay and around the globe." Few people may realize that DMI Studios developed one of the NFL's most popular websites: packers.com. DMI had the foresight to secure the "Packers" domain name as well as related names that the organization is able to utilize today. DMI Studios continues to work in a collaborative manner with the Packers and are heavily involved with the Packers Pro Shop. "DMI Studios' world is all about the Internet, and the staff -- some of whom have been with the company since its beginnings -- are ready to lead clients into their futures with an interactive vision, said Troup. On the website is a listing of many of their clients - something many businesses shy away from divulging. But not Troup who is known for relishing a competitive edge - especially with himself." "DMI Studios is at its best, he said, when a client presents them with a seemingly impossible request. It's a joke between him and his staff, he said, 'Ok, what did you sell that doesn't exist?' "
Troup states, "It's all about pushing the envelope in technology, and more graphically he refers to it as "the bleeding edge". How's that for a mental image?
" 'At the end of the day, we want our client to succeed,' said Troup."